Explore the patterns of the Micro- and Macro Cosmos through form, shape, and music. We present a bridge between the spiritual and the scientific through Art – sometimes referred to as Sacred Geometry. From the concepts of Dimensional Space, Simulation theory, Karma, Reincarnation, and Afterlife to the Science of Light, Atoms, Energy, Sound and the patterns of the Cosmos, all can be linked to visually compelling and easily comprehensible geometric models that are fun to draw and suitable for all ages. 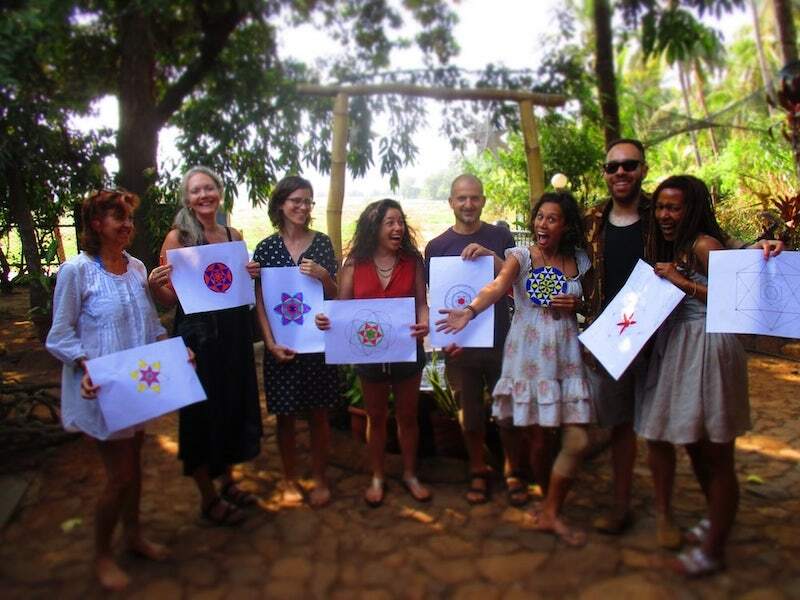 For 4 months we had our base in South Goa, running weekly Sacred Geometry sessions at different organic cafés, Yoga schools, and festivals. Very informative, interesting, friendly, and knowledgeable. Would definitely recommend and would love to delve in deeper! The 5 Platonic Solids are the only regular forms in existence. This practical guidebook teaches you how to construct and nest them perfectly inside of each other. Use the completed model to explore universal phenomena from the atom to the galaxies. A fantastic introduction into the art of 3D Geometry!